"My first shift brought the first two suspected Ebola cases to Gondama Referral Centre..."
The day itself started pretty routinely, I did the ward round and checked on how things worked and then settled down to wait for any patients. "She has bloody diarrhoea, tinnitus and hiccups - all signs of Ebola"
At the MSF Ebola Management Centre in Kailahun, Sierra Leone.London based obstetrics & gynaecology registrar, with an interest in humanitarian emergencies and their impact on the reproductive health of affected populations. London-based obstetrics & gynaecology registrar,Benjamin Black has an interest in humanitarian emergencies and their impact on the reproductive health of affected populations. He first travelled to Sierra Leone, the country with the worst recorded maternal mortality in the world, to join a team setting-up a project supporting maternal and child health in Tonkilili. Together, alongside many healthcare workers who took Ebola head-on he worked to "meet the challenge of reaching women and their children so that they can have a safe birth, and training in the community to ensure a safer future". 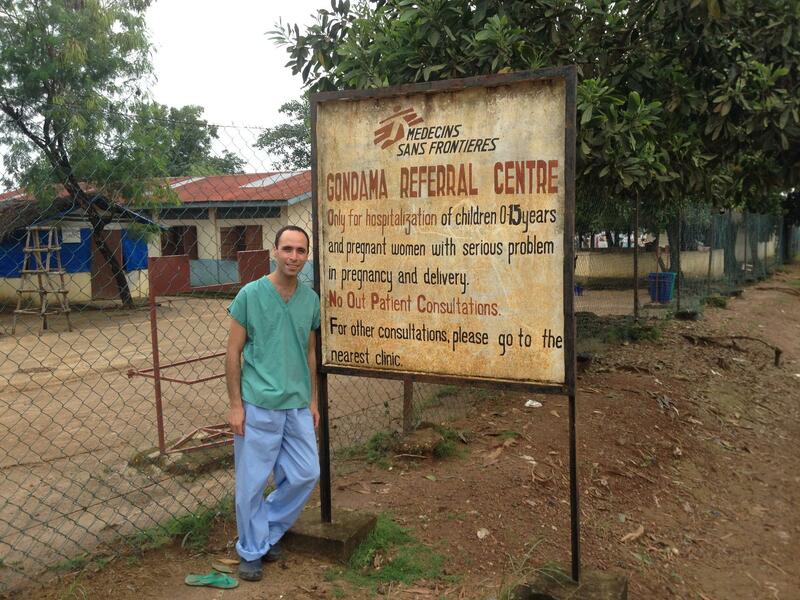 In 2014, Benjamin Black worked in Sierra Leone with MSF in an obstetric referral centre. As the Ebola crisis unfurled his activities adapted alongside it. He returned to Sierra Leone in October 2014, working in Ebola Management Centres and providing support for pregnant and lactating women infected with Ebola both here and in Liberia, as well as providing hands on support and training when needed. I ask if she’s been anywhere or taken anything to abort the pregnancy but getting a history is impossible, she’s delirious. There’s only very basic tests available in GRC, but I know she hasn’t got malaria and hasn’t got much blood left (the haemoglobin was 4.2 g/dl, normal is over 11!). I begin giving her oxygen, intravenous fluids and antibiotics, and luckily there is blood in the bank so order two units for transfusion. I then gave her medicine to try and complete the miscarriage and empty her uterus of the infected pregnancy. Later in the afternoon I get a call that a couple more patients have arrived, one is a re-admission the other is being kept off the ward. There is a foul smell coming from outside of the ward, I go to see. Sitting on a stool is a lady surrounded by a mist of flies. "As I’m rehydrating I get a call to come to maternity, an ambulance has pulled up with a woman bleeding after giving birth to a stillborn outside the clinic"
"Deep breath. 'Clamp please'. Here we go"